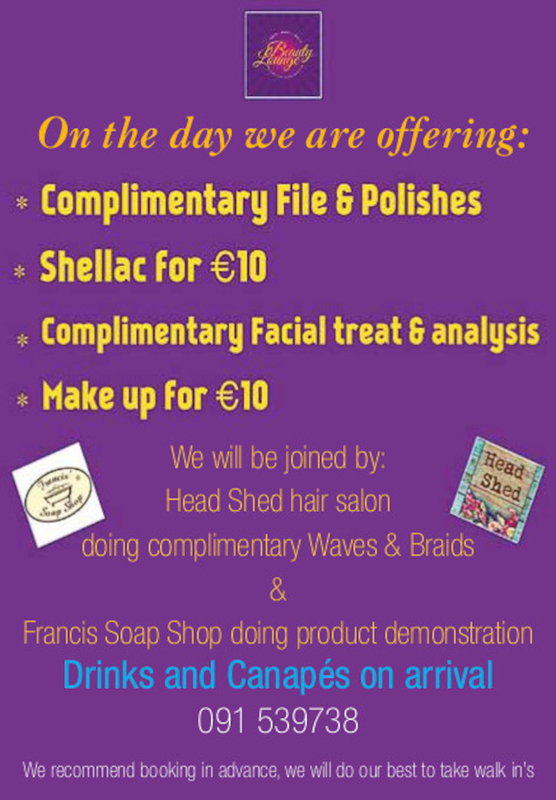 The Beauty Lounge Galway is celebrating its 5th year in business on Saturday 1st September with a day of pampering for all clients new and returning. Customers are invited to enjoy complimentary treatments by the girls and they will be joined on the day by the Head Shed hair salon and Francis Soap Shop. There will bubbles and bites to eat, prizes and goodie bags to take home and 25% off Dermalogica products. “It’s been a fantastic 5 year journey and I would like to thank our wonderful customers and local businesses for their support, “ said Selma owner of the Beauty Lounge. Conveniently located on the top floor of the Corbett Court Shopping Centre, the Beauty Lounge offers a relaxing retreat with a pampering vibe. The focus is always the customer ensuring an unrivalled beauty experience, each therapist at the Beauty Lounge specializes in a variety of treatments with an array of contemporary treatments including Dermalogica skincare, HD brows, Gel nails, Waxing, Semi-permanent lashes, Tanning and Makeup. Why pay more for your prescriptions? Page generated in 0.1111 seconds.